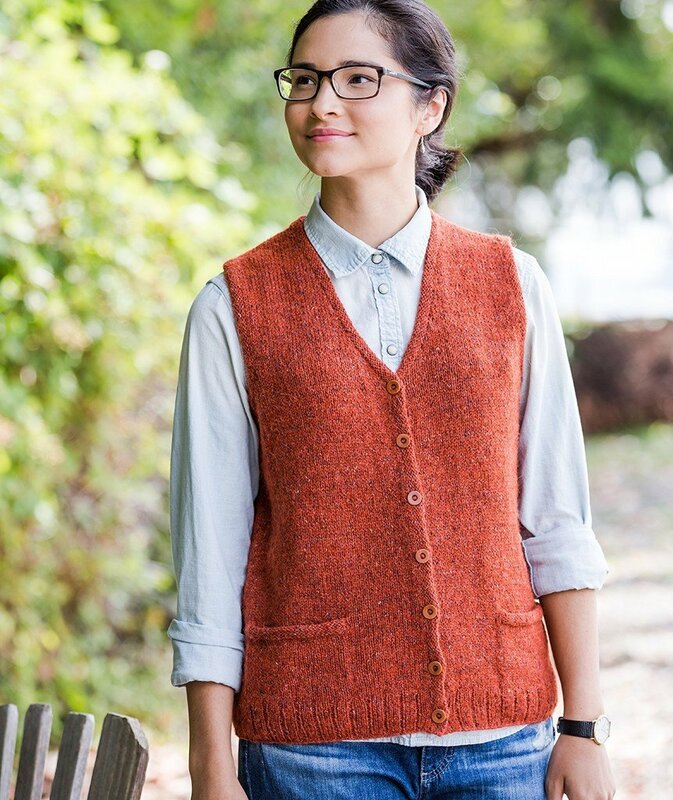 With simple styling that lends itself to the classroom, workplace or weekend, this vest is so classic, so quintessential, it could become your uniform. The jumper length has a certain schoolgirl chic. The abridged, hip-length version is a flattering layer without the bulk of a sweater. Either way, it’s a nice little primer of techniques you’ll use again and again. Finished bust: 39 (43, 47, 51, 55)"/ 99 (109, 119.5, 129.5, 140)cm, after seaming. To fit bust: 32–34 (36–38, 40–42, 44–46, 48–50)"/81–86 (91–96, 102–107, 112–117, 122–127)cm. With ease of: Approx. 5–7"/ 12.5-18cm; for more ease, choose a larger size. Measured from high shoulder (where shoulder meets neck) to hem. Shorter version: 24 (24½, 25, 25½, 26)"/61 (62, 63, 65, 66)cm. Longer version: 32 (32½, 33, 33½, 34)"/81 (83, 84, 85, 86)cm. Choose a DK-weight yarn that typically knits at 22 sts to 4"/10cm, or a combination of yarns that results in a soft fabric with some body when knit at that gauge. Shorter version: Approx. 855 (960, 1065, 1170, 1295) yds/782 (878, 974, 1070, 1184)m.
Shown in orange Rowan Felted Tweed (191yds/175m per skein); Color 154. Model is wearing 39"/99cm finished size with 6"/15cm of ease. Longer version: Approx. 1125 (1265, 1395, 1530, 1675) yds/1029 (1157, 1276, 1400, 1532)m.
For custom lengths: To lengthen or shorten body, add or subtract approx. 35 (39, 42, 45, 49) yds/32 (36, 39, 42, 45)m of yarn per 1"/2.5cm of knitted length. US 6 (4mm) needles, or size to obtain gauge. US 4 (3.5mm) 24"/60cm and 16"/40cm circular needles, or 2 US sizes/.5mm smaller than gauge needle. Locking markers or for ‘clip-and-turn’ and for button placement. ⅝"/16mm buttons: 7 for shorter version, 9 for longer version. Needle; thread or yarn. 22 sts/30 rows = 4"/10cm in stockinette stitch on larger needle, after blocking.